FilmLand Empire: Is Warner panicking over Green lantern? The green superhero flick is only two months away from release yet Warner has just forked out an extra $9 million to work on the special effects, and mainly to fix the all CGI green suit. Now it is not unusual even for a big blockbuster to have some last minute work done, or even some scenes reshots a few months, weeks even from its release date. Saying that, this DC Comics adapation still seems like a massive gamble. I had already highlighted this in my post about the microbudget trend. 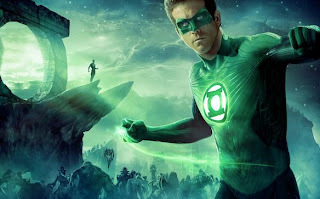 The green lantern is virtually unknown to the non comics readers, and no superhero movie has ever reached box office super heights unless there was a well known character such as Batman or Superman. The only exception so far has been Iron Man but this had Robert Downey Jr and a more mature and less geeky feel to it which suited a wider audience. 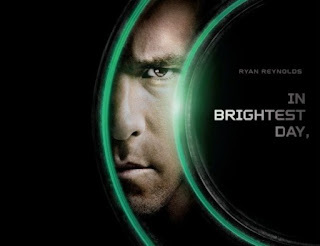 The green lantern on the other hand is completely out there, judging by the trailer. And Ryan Reynolds has still not been able to carry a movie on its own shoulders. Will the 17th of June release date be Warner's brightest day? Or blackest night? The need to fix the suit highlights a headache that has been plaguing the production ever seen the first shots and trailer were released to the public: it just does not work in its present form, and the blogosphere has been pretty vocal about this. Sorry for being crude but in some parts of the trailers, it looks like Ryan Reynolds has just been sneezed over and covered with radioactive snot. So either Warner is having a last minute panic after some disastrous test previews, or they are just making sure everything is absolutely perfect to make their new superhero (and his suit!) believable. I have to say, kudos to them for blowing that much money ($150m budget) on an origin story that will not be as timid as so many before who tested the water with their audience, judging by the completely mad trailer.